I must admit, despite being a self-confessed musical lover; I knew practically nothing of Sunset Boulevard as a production. I purposefully didn’t read anything of the premise so as to get the full novice experience and boy, was I glad I did! Although of course I was expecting the usual big numbers, the crowd pleasers, the toe-tappers of Andrew Lloyd Webber, I can honestly say that I was not expecting Sunset Boulevard! As the lights dim the overture swells in true Hollywood style and immediately draws you in with an alluring swirl of grandeur tinged with foreboding; indeed a taste of all things to come. The scene is set in the late 40s; the hedonistic post-war days when the film-making machine of Hollywood was in full flourish complete with casting couch, fickle promises of lunch and superficial deals. The story whips along at pace as we are introduced to the charismatic Joe Gillis, a script-writer who stumbles across the forgotten world of Norma Desmond whilst escaping the clutches of his debtors in a rather inventive and effective black and white high-speed car chase. Norma Desmond is a faded silver-screen darling who exists within a world completely detached from reality. Her devoted companion, Max (beautifully and sensitively played by Adam Pearce) indulges her every whim and is always on hand to remind her that she is “the greatest star of all.” She does not understand that the industry has moved on and that she has been left behind, forgotten and unloved. Her beautiful house is shrouded in shadows of tired grandeur and cuts a sharp contrast to the technicolour hustle and bustle of life outside her palatial walls. Joe is drawn reluctantly into Norma’s world as he agrees to write her ‘comeback’ film which Norma sharply corrects him as her, ‘return!’ Luxury lodgings, a new wardrobe and his every need met traps Joe in this gilded cage of gratitude and service. The increasing demands and needs of the formidable yet fragile Norma Desmond threaten to choke Joe as he longs for the young and vibrant scene beyond his now stale and claustrophobic existence. The namesake song ‘Sunset Boulevard’ performed brilliantly by Danny Mac as Joe Gillis, reveals how this new cynicism and resentment is building within him as he is torn between loyalty, love and life. A choice that is eventually and inevitably, taken from him. Sunset Boulevard is a truly sumptuous production – the glitz and glamour of bygone glory days stitched together with an almost Hitchcock film noir thread to provide a heady mix of light and dark, joy and sorrow, hope and regret. 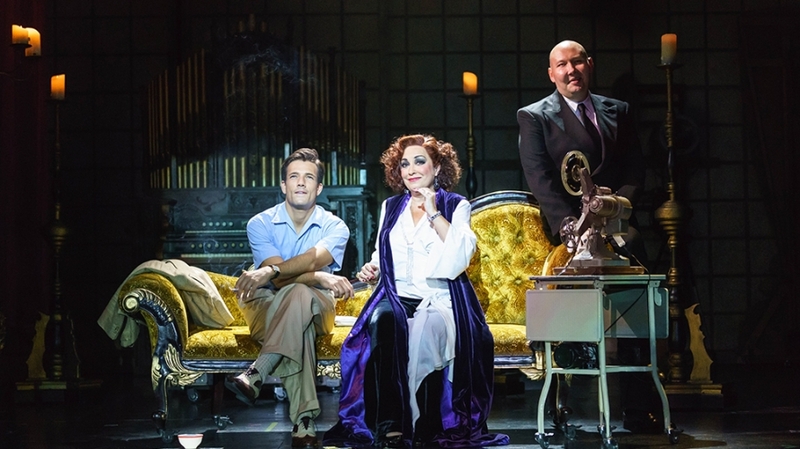 Although the audible appreciative gasps of some of my fellow audience members when Danny Mac appeared at the pool in his bathing shorts may beg to differ; Ria Jones as Norma Desmond basking in the warmth of her beloved spotlight in “As If We Never Said Goodbye” was for me by far, the most glorious highlight of the show. The sheer magic of the moment moved us to tears as the whole audience was held, spellbound. Ria Jones certainly encompasses the screen goddess that is Norma Desmond and watching her perform was for me a real privilege and, if a standing ovation on opening night is anything to go by – I guess I’m not the only one thinking that she’s ready for her close up!